Pictured (from left): Vincent Cornelius (’89), Ernesto Borges (’84), Kenya Jenkins-Wright (’03), and Melinda Rosales Byerly (’03). The Northern Illinois University College of Law held its 14th Annual Minority Alumni Reception, hosted by alumnus Vincent Cornelius (’89), on February 22, 2017 at the Illinois State Bar Association’s office in Chicago. Current and prospective students, alumni, faculty, judges and political leaders from the Chicago area attended the reception, which included special presentations honoring alumni Ernesto Borges (’84) and Kenya Jenkins-Wright (’03). Illinois State Bar President Vincent Cornelius (’89) honored Ernesto Borges (’84) with the Excellence in Career Achievements Award for his outstanding professional accomplishments and devotion to the public good. Borges, one of Chicago’s most notable attorneys, is the senior partner of “Billbusters,” or Ledford, Wu and Borges, LLC, the largest minority-owned bankruptcy firm in the Midwest. The firm has filed over 60,000 bankruptcies to help people save their homes and property as well as eliminate oppressive debt. A military veteran, Borges has received two Bronze Stars and a Purple Heart for his sacrifice and outstanding service to his country. Borges is also active in many civic, professional and social organizations. 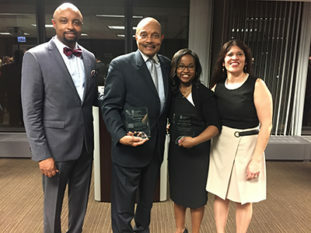 Northern Law Alumni Council President Melinda Rosales Byerly (’03) presented Kenya Jenkins-Wright (’01) with the Excellence in Service and Leadership Award. Jenkins-Wright was honored for her exceptional leadership and distinguished record as a public servant. Jenkins-Wright serves as general counsel of the Illinois Guardianship & Advocacy Commission. She is also the current president of the Black Women Lawyers’ Association of Greater Chicago, celebrating its 30-year anniversary under her leadership. Jenkins-Wright is active in many organizations including the Illinois State Bar Association, Chicago Bar Foundation and Cook County Bar Association. She is a member of the NIU College of Law Board of Visitors and Alumni Council and has been honored with numerous awards for her leadership and service to the legal community. Cornelius, a 1989 Northern Law alumnus, has hosted the Minority Reception since its inception and has watched it continue to grow each year. Cornelius is a sole practitioner with offices in Wheaton and Joliet, IL. He was sworn in as the first African-American president of the Illinois State Bar Association on June 17, 2016 and also serves as a member of the NIU College of Law Board of Visitors.